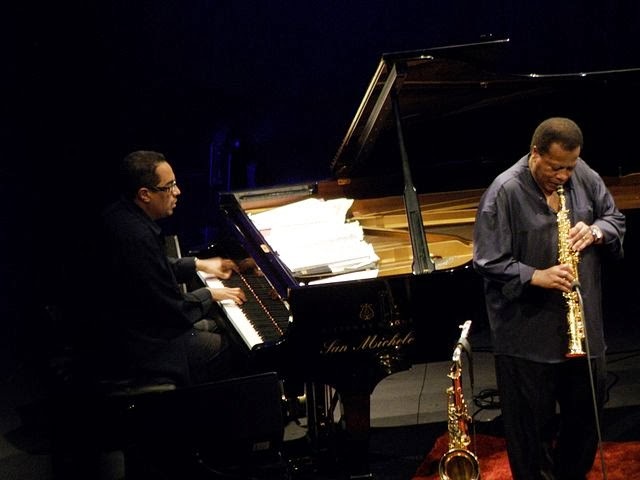 Danilo Pérez and Wayne Shorter. Photo from wikimedia commons. Last Friday, I had the privilege of seeing Wayne Shorter, one of the most famous living jazz performers and composers. Despite turning 80 last August, he continues to tour and perform, and just won a Grammy last month. I couldn't pass up the opportunity to see Shorter live. Wayne Shorter's jazz is different than your grandparent's jazz in that it has been mixed with classical avant garde. More specifically, the chords that Shorter is using don't have the same hierarchical structure that characterizes most classical and popular music, structure most people's ears have come to expect. Because these chords don't have this hierarchical structure, they can basically be interchanged with each other, or placed in any order. This may produce new sound options, but at the end of the day (or concert), it's harder for a listener's mind to process and group musical ideas together. On top of unfamiliar nonhierarchical musical structure, Shorter's music is based on improvisation, meaning what's happening on stage, while guided by a loose road-map, is somewhat made up on the spot. Each of the four musicians trade taking charge of the main musical idea. While this model lets each musician shine, sometimes it means that just when the music seems to get going somewhere, someone would sabotage that direction and purpose (as they would a conversation) and take the musical conversation topic a new way. While this sudden change in direction can be musically exciting, it can also be exasperating. Improvisation is risky, which is kind of the point. Because of the way the music is designed around improvisation, however, it is hard for the musicians to think through long-term music goals and structure on the fly, at least structure that builds on itself to achieve an end goal, as one would with a typical classical music number of the same length (I think they played 5-6 selections in the 90-minute concert). The end result was a concert of music that seemed like a series or string of inconsequential, unmemorable ideas stuck together. By the end of the concert, I was sure that something interesting happened, but the music was so ephemeral that I couldn't capture any of it in my mind. About the only musical ideas I remember are the few short rhythmic vamps which were the musical glue holding many of the pieces together. These vamps continued or returned through a piece, often returning with different harmonic underpinnings. While this structure is interesting to those who are in the know, I imagine that many are left wondering what really happened. In short, going to a Wayne Shorter Quartet concert is like listening in on a conversation for which we don't have any context, between a group of old friends we don't know. We can tell that they find the conversation scintillating, but we're not sure where it is going or why certain things are happening. At the same time, we get the impression that they are very accomplished musicians playing hard things, and that they feel it is very rewarding. To make the concert more palatable, it would have been nice for the group to announce their songs or explain a little of what they were doing or how the music was structured, bringing us in on the conversation, but there was literally no talking on stage. Perhaps they expect us to know. And I'm sure there were many in the audience who do know. But coming from the perspective of someone who has studied jazz history, music theory, and the avant garde, and still am not exactly sure what is going on, I would guess that number is somewhat small. Have any of you heard Wayne Shorter live, or even his recorded music? What do you think? Who composed those Olympic themes? This week, I've been engrossed in the Olympics, and besides wishing the announcers spent more time on the figure skaters' music, I've been thinking about the music of the Olympics. Where did those themes come from? When were they written? I found this essay by the Smithsonian magazine's Natasha Geiling that answered many of my questions. One of the most interesting things in the article is how the most commonly used Olympics themes in broadcast coverage, "Bugler's Dream" by Leo Arnaud, wasn't written for the Olympics. How did it get associated with the Olympics, then? Well, someone at ABC decided to use it with their coverage of the 1968 Winter Olympics. And it stuck. To me, this music just screams Olympics, but sporting events were not on the composer's mind when he wrote it. Also interesting is that this preference is entirely American broadcast-based—people outside the U.S. don't use the same music at all. Also used extensively in NBC's coverage is John William's "Olympic Fanfare and Theme" (see above—and why don't the Olympics use marching bands more?). William's theme was written for the 1984 Los Angeles Summer Olympics, and was also adopted for Olympic broadcast coverage, especially the summer Olympics. But, interestingly enough, the theme NBC most often uses in their coverage is a hybrid, starting out with Arnaud's and then splicing into Williams'. Besides television coverage, however, neither theme shows up during the actually games—not in the opening and closing ceremonies nor anywhere else—unlike the Olympic Hymn, which is official. But I'm okay with NBC's music, because I think the orchestral brass fanfares add gravity to Winter Olympics events that otherwise might fall short. For instance, slopestyle. Did anyone see that Swedish skier with the pants that were way to big? And carried a raw egg in his pocket? The egg broke, if you were wondering. What's your favorite Olympic theme? Several years ago, I decided to watch all of Richard Wagner's Ring Cycle (or Der Ring des Nibelungen) over Christmas break. These four important (and frankly sometimes boring) operas are so influential to music history that every musician really should see them at some point. * Not only did Wagner change how operas were staged, but he also changed the way music was written. Did you know there is more written about Wagner than any other composer? I saw the the operas on five nights throughout the break, because Götterdämmerung (#4) is just so long. Fast forward a few years: 2013 was the 200th anniversary of Wagner's birth, and many opera companies put on Ring Cycles. Inspired by the outpouring, I'm sure, John Wagstaff at the University of Illinois made a challenge on the Music Library Association's listserv—sum up the entirety of the Ring Cycle, about 15 hours of opera, in one 140-character tweet. There were quite a few entries, and because each new entry included all the previous tweet submissions below the new one, reading it became a little like reading the "Twelve Days of Christmas". Which lead me to think: "One golden Ring!" Not long after, the following had been written. I hope you enjoy it. A mound of stolen Rhine gold. And a flight of Valkyries. and a boy who's never known fear. and a pyre that consumes the gods. And a boat-load of Leitmotifs. *If you just have time to see one, I think Das Rheingold is the way to go. Also, it's the shortest.